Craig Sager, Sideline Sage Of Hoops And Suits, Dies At 65 : The Two-Way The NBA sideline reporter was known for his outlandish wardrobe nearly as much as his broadcasting chops. But in his decades-long career, few could match either. He had been diagnosed with leukemia. Craig Sager, on the sidelines of the 2016 NBA Finals. The network also posted a video on Facebook commemorating Sager's career. Sager spent two decades covering pro basketball on TNT, work that earned him an induction into the Sports Broadcasting Hall of Fame. And during his time on the sidelines, Sager had no problem standing out. 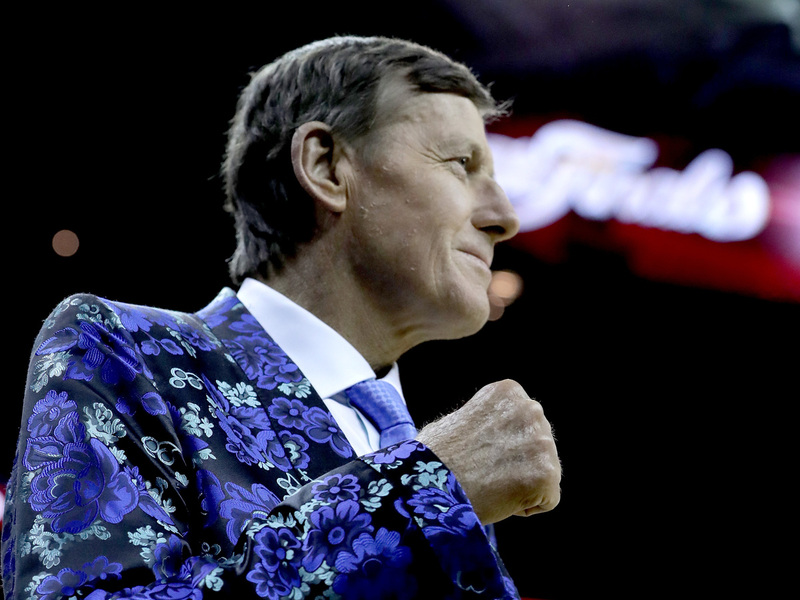 Argyle, paisley, floral, seersucker — name any pattern of fabric, and Sager wore a suit made from it. "That's always been a badge of honor for Craig," says his TNT colleague Ernie Johnson. "You say, 'You can't possibly wear that.' It's like, 'Hey thanks, you couldn't have said anything nicer to me.' "
Sager had charisma and unmatched rapport with players. Even when players like future Hall of Famer Kevin Garnett stopped live interviews to insult his brightly colored suits — "take this outfit home and burn it," Garnett once told him — Sager was capable of turning those moments into compelling television. In the world of basketball, Sager's name towers nearly as high as LeBron James'. He was among the first to interview Kobe Bryant at the NBA draft in 1996. He joked with Shaquille O'Neal on the sidelines at All-Star games. And LA Clippers point guard Chris Paul always made time for Sager — even after tough losses. "When you see Craig, you pep up," Paul said once. "Because you know that he has the same respect for you that you have for him." Doris Burke, a sideline reporter with ESPN, shares that admiration. "There's a saying in basketball: Game recognize game. There's a reason Craig Sager is beloved, and it's the beauty and the magic of what Craig Sager does," Burke says. Sager's career started in April 1974, when he was a 22-year-old from Batavia, Ill., who rushed to an Atlanta Braves baseball game. Hall of Famer Hank Aaron was one hit away from breaking Babe Ruth's untouchable home run record, and Sager wanted to cover it for his AM radio station. He didn't have press credentials, and his boss had threatened to fire him if he showed up late the next day. But Sager went anyway. Somehow, he wound up in the third base photographer's pit on that historic night — just as Aaron went to bat in front of a roaring crowd. It was one of the biggest moments in baseball history, and Sager did the unthinkable: He got his tape recorder, jumped onto the field and chased after Aaron. It's a dogged determination that never left Sager, even after he switched to basketball and spent decades on NBA sidelines. And those outlandish suits? Well, as Sager told Weekend Edition Sunday host Rachel Martin in 2012, he never minded the ribbing he would get from Garnett and others. He had another audience in mind. "Some people maybe think it's too outlandish, but I have fun," he said. "I buy it all myself. I pick it all out myself. I once in a while get some help from my 7-year-old daughter. Some people might not like it; my 7-year-old, she likes it."